This classic side dish recipe is easy to make and features a perfect blend of herbs with garlic. All you have to do is toss the potatoes with olive oil, rosemary, garlic, and thyme. These potatoes get crispy on the outside and stay fluffy on the inside and you'll never have to worry about leftovers. In fact, they are so delicious and satisfying, you won't have any leftovers! Fingerling, rose gold, or Inca gold potatoes or a mixture of new potatoes are a delicious and colorful variation to use when cooking with this recipe. Save some rosemary and thyme sprigs to decorate the serving platter or dinner plates. For a little heat, stir in some cayenne pepper! Per Serving: 332 calories; 14g fat; 46.7g carbohydrates; 6g protein; 0mg cholesterol; 174mg sodium. This is a great starter for roasting potatoes. I prefer to par-boil my potatoes before roasting, as I find I get a bit better texture, but for a straight roast, it's hard to beat the garlic and rosemary here. 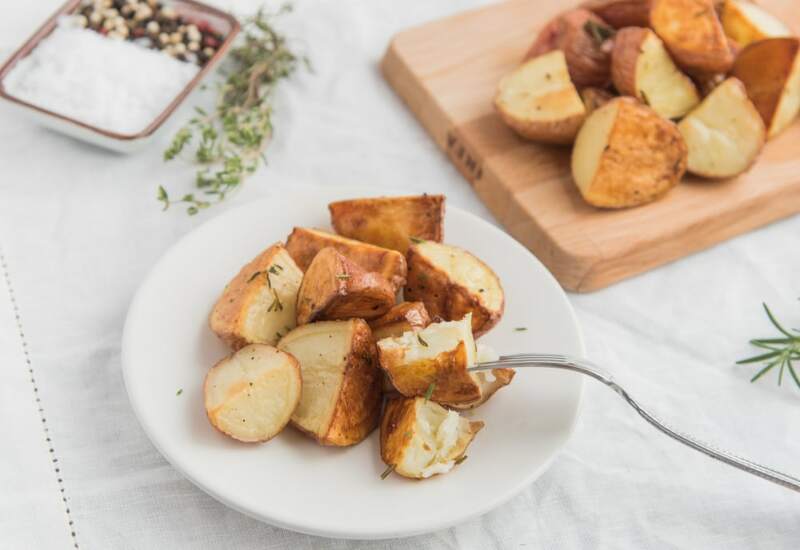 Just your basic roasted herb potatoes. Regardless, it's still a classic. I like to toss some sliced shallots in the mix as well as some red peppers. This pairs very well with beet sauce. Trust me on that, you will love it! I love my potatoes roasted - I added two sliced onions to the bake - goes well with meat. So delicious and so simple. I cooked a cast iron steak and used these as the side! This is a gorgeous, simple (and staple!) side dish with all the right proportions. SUPER yummy as a side roasted chicken! I threw in some other root veggies and it added some pops of color - nice and simple, one of my go-to sides, hard to mess up.